You can do it my free manual. The manual is 11 pages in length and very detailed. The only thing I need from you is a valid E-Mail address. Write me at: chetnellen(at)gmail(dot)com and I will forward the manual to you with pictures in full color. You can upload your conversion manual here as an attachment. Welcome aboard Young Man glad you decided to come over.If you want me to upload your files I've got them on my hard drive. The reason for writing this manual is to describe the steps taken in building my trike. The purpose for building a trike was made evident, that at 78 years of age with a desire to continue riding, I needed more stability. I am the visitation pastor for our church and use my Silver Wing for over 90% of all my calls. Many weeks I drive over several hundred miles in calling on seniors and shut-ins that the only contact with the church is through this ministry. 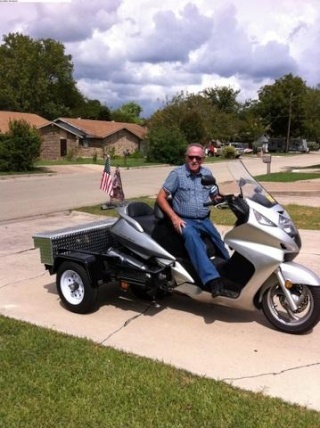 I prayed about the need of a Trike and God pointed me in the right direction so that I would be able to continue using my Silver Wing in HIS ministry. 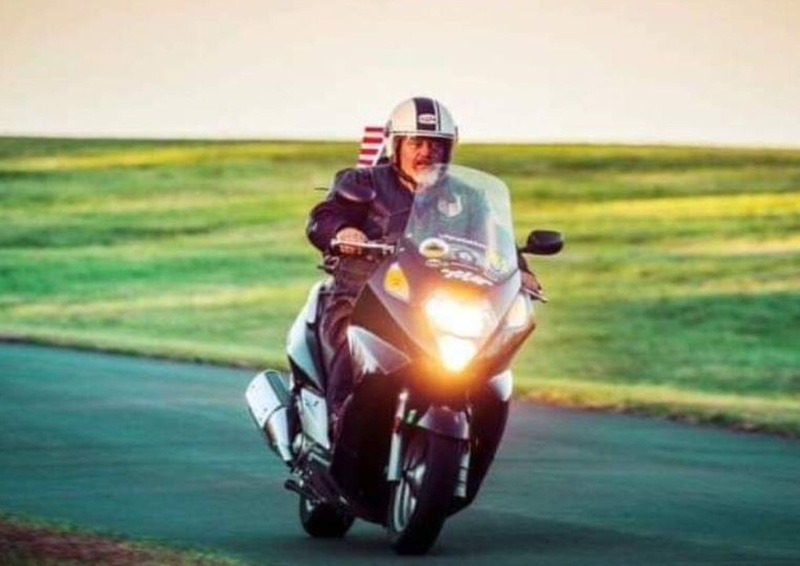 On Sept.16, 2010 at 4:00 am I woke with the realization that God was prompting me to get up out of bed and go to my computer and type into the search engine “Motor Cycle Trike Kits” I did, and was directed to a website that showed me a picture of a cycle that was converted for under $600. I had done similar searches for hours on the previous days and not found this website, but at this exact time God directed me. I thanked Him and went back to bed and slept with peace. Also, I needed to built this trike the way I did, because I did not have the resources to purchase a $3,600.00 or $5,000.00 ready made conversion kit. God saw my need and supplied the way. The website by the name of MOTORCYCLE HONDA YAMAHA KAWASAKI HARLEY SUZUKI TRIKE HOW I TURNED A BIKE INTO A SUPER TRIKE FOR UNDER $600 gave me the inspiration to do it myself. The following information is given to you free of charge for your development. Step 1. 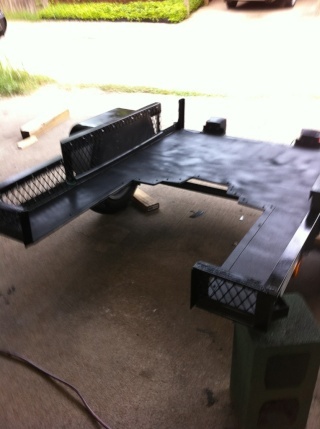 Purchase a 42” X 60” utility trailer and remove the tongue. 2 bolts hold it on. Remove the 2 bolts and the tongue and begin the process. Stet 2. Material to Purchase or have on hand. a.You will also need a Reciprocating saw in some areas with metal cutting blade. I used 3 blades while doing the job. b.3 fiber metal cutting blades for your 7 ¼ “ circular saw. c.You will need a soap stone for marking the metal to be cut. d.You will need a face mask or eye protection. e.A pair of gloves for handling hot metal. f.Two concrete block will help to hold the trailer bed up for working on it. g.A pair of saw horses or workbench for laying material on when cutting. h.8 each 3/8”X 1” bolts with nuts with nylon locking plus lock washers. i.35 each ¼” X 1” bolts with nuts with nylon locking with lock washers. j.2 metric bolts, 10 Met. 1.25 X 75 long, no nuts Lowe’s #216019 @ $2.92 each. k.2 lengths of 1” X 36” flat bar. Measure in 8” on both sides. The long cut is 26” long. Go over 4 ½ “ then up 4” then 2 ½” on a 15% angle Do both sides the same and then cut out the center line. It should be about 7” long. Since this leaves a rough edge from cutting it is advised to use a 1” angle along the edge for support as well as protection. Step 4. The trailer comes with higher sides than desired, so I cut the sides down from the 26” mark to the height of the fender all the way back. The angle iron that I cut off was used to put back as the top rail after cutting off the excess cage metal from it. The angle was bolted on with ¼” bolts. The next picture shows what was done. Step 5. From the 26” mark to the front of the trailer, I cut the sides down to 6” and then replaced the angel along the top for support with ¼” bolts. Step 7. You will want to cut off the stop lights from the sides of the trailer and mount them on the back. View picture below. Step 8. Remove the center stand from the scooter and install the bracket that you make. Use a 24” X 1 1/4” angle iron. On the kick stand side of the scooter measure in 9” and mark the angle iron. Cut 2 pieces of 1 ¼ flat bar 1 & ½ long. You may want to drill the flat bar before cutting with a 7/16” hole near the top edge. Weld the flat bar to the angle iron with 9” from the outside to the outside of the flat bar. Now measure the inside distance of the center stand that you removed and place the remaining piece of flat bar at the distance. Mark it and weld it. Cut 2 pieces of 1 ¼ X 4” flat bar and clamp 1 to each end of the angle iron with a C clamp or vice grips. Now drill a 3/8” hole through the flat bar and angle iron about 1 ½ “ from the ends. Cut 2 more pieces of flat bar 6” long and drill 3/8” holes about 2” from the ends. Cut 2 lengths of angle 9” long. Now weld the 4” to 1 end of the angle and the 6” to the opposite end with the pieces going in the opposite direction. Make sure that the angle will fit flush against the cut side of the trailer where you have bolted on the angle for the cut out. The 6” flat bar needs to be welded to the angle iron with the 3/8” hole closest to the angle. Do the same for the opposite side of the trailer. Before you place the trailer in place to bolt up you need some way to balance your bike on a flat service where it is secure and will not fall. Once you have secured your bike, measure from the ground to one of the bolts on the side of the scooter and check the measurement on the other side. Adjust the bike to make sure that the measurements are the same. Now you are ready to install the bracket to the center stand holes. **Use the bolts that were removed from the center stand to bolt up the new bracket. Before you bring the trailer around you will need to cut about 2” – 3” off the bottom of the rear fender of the bike in order for the trailer to fit in under it. You should have about ½ to 1 inch clearance between the fender and the bottom of the trailer. You may want to spray the floor of the trailer with a coat of rubberized paint spray. This is the same type of spray that they use for pick up beds. It also helps things not to slide around if you have items in the storage area. Lowe’s has it for about $9.00 a can. One can of spray should be enough. Step 9 Move the trailer around and make sure that you are installing it evenly on both sides. Block the wheels so that it will not move and bolt on the 6” flat bar bracket to the trailer and then connect it to the center stand bracket with 3/8” bolts with lock washers. This is not the illustration I wanted for I did not take a picture of the installation of the trailer, but this illustrates about securing the bike and blocking the wheels. Step 10. Remove the top bolt out of the side panel above the kick stand. You will need and Alan Wrench to remove this bolt. Cut 2 pieces of flat bar 12 inches long and drill a 3/8” hole in one end. Bend the end with the hole more than a 90 degree bend. You will have to fit it to the angle of the bike. **The reason I prefer to bend it rather than welding it, is because the place you are installing this piece of flat bar is a difficult angle. Use the bolt you purchased 10 Met 1.25 X 75 long with 2 washers and secure it. .
Repeat the same on the other side, then clamp down the flat bar and drill a 3/8” hole through the flat bar and the angle. Do this on both sides. Line up the front of the trailer even with the 10 Mil 1.25 X 75 bolts on both side that you are installing. Step 11. Remove the coverings on the sides of the cycle under the rear seat. You will see above the shock a piece of metal with a rubber washer in it. Cut 2 pieces of flat bar long enough to reach from the rubber washer to the side of the trailer. Cut 2 pieces of flat bar 1 ½ “ long and drill a 3/8” hole in them. Weld the flat bar with the hole to the longer piece. Now cut 2 pieces of 1 ¼ “ angle and notch both ends about 1 ½ “ down going the opposite side of the angle. On one end drill a 3/8” hole and then using the 3/8” X 1” bolts connect the angle and the flat bar to the flange with the rubber washer. Keep the rubber washer in place. You will have figure the length of the angle you want and where you want to bolt in down to the trailer behind the rear wheel. You will have to notch out an area on the side panels where the angle and the flat bar attaches to the rubber washer. You will have to look at this and estimate how much to cut out. You will also have to cut off about 1 ½ of the square area with the tip on it, on the inside of the side panels. You will see this as you look at the inside of the panels. Once you have this done you can bolt them back in place. Step 12. You are ready to put the tool box in place and secure it. Before I cut the tail gate I placed the tool box in place and figured how tall to make it so that it would meet the bottom of the drawer in the tool box. You can secure it any way that seems good to you. Step 13. It is time for you to wire the lights for safety reasons. Also you will need to connect the license and safety inspection if you have them to the rear of the trike. 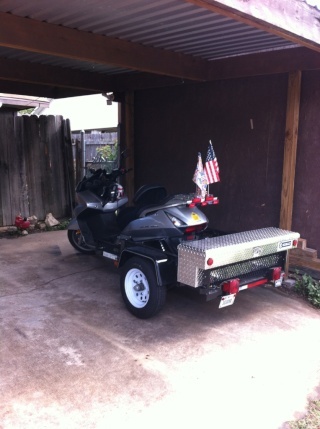 It is no longer a trailer, but a trike on the cycle. You are ready to test drive. You may notice that the front wheel may shake while hitting bumps at low speed. This is normal. When you go over 25 – 30 everything reacts the way you would expect. You will need to practice turning all over again. You do not lean to make turns, but you turn the handle bars in the direction that you want to turn. REMEMBER TO SLOW DOWN ON ALL TURNS. Step 14. Go for a ride and enjoy yourself and be very careful on all your turns. Have a great day. NOTICE: I am furnishing this information at no cost to you. I do not assume any liability for damage that may occur due to converting your scooter into a trike. This information is given freely for the individual to use. You must use your own discretion as to whether you what to use it or not. Happy motoring and may God bless you and yours. P.S. After you have ridden your trike for a 100 miles or so, re-check the bolts to make sure that they are still tight. Also I would appreciate it if you would drop me a line and let me know what you think of the manual and if you are going to convert yours. Send me some pictures of your conversion. I had one person write me back and said that after seeing what I had done he was glad that he had purchased a Dawson Trike Conversion Unit. He said that with the installation the cost was around $6,000.00. I can applaud him for his choice of products, however when the dust is all settled, I will be traveling down the road at the same rate of speed and still have over 4 to $5,000.00 in my bank. He may have the glitter on the trike, but I have the glitter in the bank. This unit may not be for everyone, but for many who do no have the means to purchase the commercial Trike Conversion Units, this self built unit does everything the others do and saves you money at the same time. You make the choice, pay the commercial businesses, or build you own and keep the difference. The choice is yours! I love this kind of ingenuity. Looks great! Here it is so you can down load it and print it. Dale how in the blue blazes did you get it to accept it as a pdf? I tried and all I got was a blank message and my computer laughed at me and said I couldn't upload it. Y'all take notice the good Preacher DID make enough room for 2 SETS of golfclubs!! SPECIAL NOTE: I have only had my conversion for 2 weeks. I noticed that when I ran over rough pavement that I heard a clanking sound. I thought that it was the tool box and so I tightened the bolts and checked it. To my surprise the noise did not go away. Upon checking further I found that where the leaf spring attaches to the rear what use to be the trailer, there was play that when going over a bump they clanked against the metal. TO CORRECT you may want to go to Lowe's or some other store and buy in the pluming department a sheet of 4" X 6" X 3/16" rubber. Cut 4 strips about 1 1/4" wide by the length of the sheet. Now place a strip on the top and one on the bottom of the spring where it goes through the bracket. Tie it front and back with tie straps. It works, no noise. PTL. Has anyone tried to make Pastor Chet's conversion?